The thing that we love most about Tenerife is the diversity in landscape and activities that you get to do while visiting this unique destination in the Atlantic Ocean. While many visitors only see Tenerife as a beach & sun destination, we love to combine the days on the beach with active days of walking and hiking through Tenerife's forests and volcanoes. If you are looking for a sunny and warm destination for an active holiday, Tenerife might be the perfect destination to consider, as well as two other islands in the archipelago: La Gomera and La Palma. The great thing about the Chinyero Walk is that it is circular, which means that you will be walking in a loop around the actual volcano and you will get back to the point where you started on a different route that the initial one. We love circular walks and hikes, since this way we get to see something new every moment, instead of doing the same linear route back and forth. Since this is a circular walk you can start at different points and go in any direction that you want. For example you can join the walk from above the picnic area Arenas Negras, where you can leave your car in the big parking next to the picnic area. We came from Puerto Santiago and drove towards Tamaimo, then took the TF-82 road and in Chio we joined the TF-38 road, which we followed until the starting point of the walk. On the TF-38 you will pass by Mirador de los Poleos, where you can stop for a few minutes for pictures. Then we only drove for a few more minutes and there was a small parking site on the left, where we could park the car. We marked on the map below the first point which is where we left our car, but you can drive for 500 m more and leave the car in a bigger parking, exactly where the Sendero del Chinyero is marked on Google Maps. Since we left our car at the first point we walked around 500 m more each way through the forest, which is exactly what we wanted to do. But in case you don't find a free spot in the first parking, you can always drive a little further and see if there's a spot available in the next one. We used the app All Trails to record the data about our route. Remember that we had parked our car a little bit further down the road, so if you park yours where the Chinyero Sendero is marked on the map above, you will walk around 1 km less in total. We did this easy Tenerife walk on a sunny Sunday in February and although we started at around 11 in the morning, the thermometer already showed 15C at that moment. The Chinyero volcano started erupting in November 1909 and the eruption lasted for 10 days. Nowadays this entire area is protected and has been declared as a nature reserve under the Chinyero Special Natural Reserve. 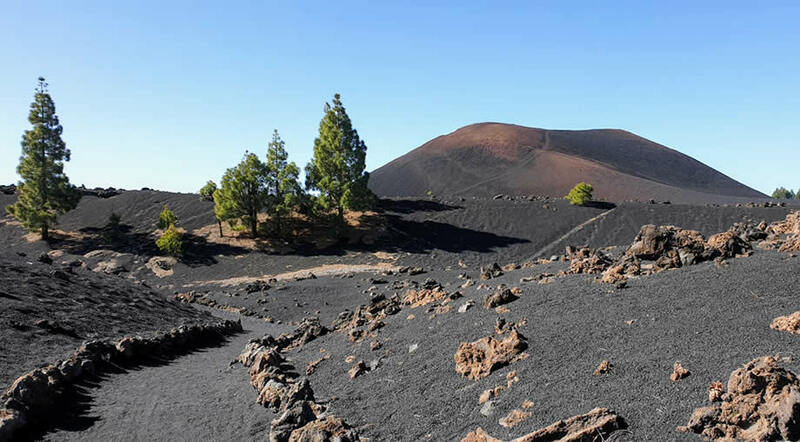 The Chinyero volcano is 1560 m high and this walk will take you around this volcano which is located close to Mount Teide (the 3rd highest volcano in the world). The Chinyero loop is an easy walk, perfect for families traveling with children and people of all ages. 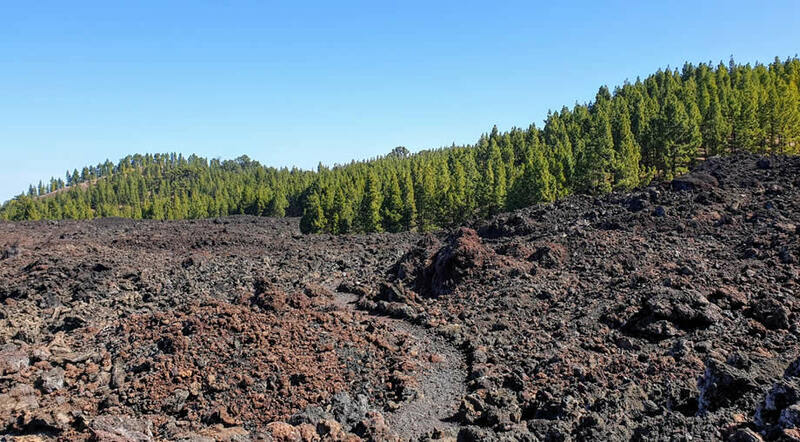 Of course we do recommend that you wear suitable hiking shoes on this route, as you will go through lava fields and pine forests and it will be much easier if you have the proper shoes. Our hike started in the shade through the pine forest and it's easy to follow the marked path all along the way and you will also see signs from time to time, indicating the direction, as well as other hiking trails in the area. In our app All Trails the route already had marked various vantage points, from where you could see Mount Teide (you can see those points in this screenshot from the app). So on a clear and sunny day you'll get to see Mount Teide from different angles, which is always an impressive sight. After we got out of the forest we walked through a lava field in the sun, which was quite welcomed after the shaded forest. It was quite interesting to see how the landscape changed several times and in such a short walk you will get to see different types of vegetation and micro climates (a characteristic feature of Tenerife). For us it was a leisure walk and we even stopped for a small picnic half way through our circuit. We recommend that you bring plenty of water and if you plan on doing the Chinyero walk in summer, try to arrive early to avoid the midday heat. We finished our walk around 2 PM and at that time we started to see more and more people coming in and when we got to the car park it was quite full. We were almost on our own on this route up until 1 PM, since we only saw maybe 5 or 6 other people along the way coming from the other way around, which meant that they probably started at Arenas Negras. Would we recommend the Chinyero loop? YES, especially if you wish to have an active holiday in Tenerife, you should really add it to your list of things to do. We really recommend the Chinyero walk for anyone who wants to explore more of Tenerife's wonderful nature. It is one of the easy hikes in Tenerife and it's actually not even a proper hike, since it's so easy that almost anyone can do it without a big physical effort. If you're not sure where to start with walking in Tenerife and you feel overwhelmed by the multitude of options, then the Chinyero walk is a good place to start. It's easily accessible, easy to walk and relatively short at just 6 - 7 km (3,7 - 4,3 miles), depending on your starting point.